A home is where people spend the majority of their days. Most people occupy their residences for up to 16 hours each day, making a safe environment a priority. When spring mold latches onto indoor surfaces, the surroundings become a breeding ground for all sorts of illnesses that affect breathing. Springtime is an opportune time for molds to flourish. The last of winter’s snows melt away, and the spring showers add plenty of moisture to the environment. Since mold feeds on both oxygen and moisture-rich spaces, the dampness inside a home makes it a haven for spring mold growth. Thousands of mold varieties grow in the typical American home. Five of the most common indoor molds are Alternaria (causes allergies), Cladosporium (triggers asthmatic symptoms), Penicillium (causes allergies and asthma), Aspergillus (can provoke lung infections) and Stachybotrys (can cause severe breathing complications). Mold spores are microscopic and therefore can be inhaled easily. The health consequences of prolonged bouts of breathing in mold spores can be detrimental, especially to individuals with existing respiratory conditions. Spring mold spores, whether living or non-living, have the ability to wreak havoc on an individual’s health. The molds Alternaria and Cladosporium are the most infamous of all mold spores to cause allergies. Cladosporium flourishes in the great outdoors as well as the indoors. The airborne characteristic of the spores allows them to spread far and wide. Different people experience varying sensitivities to mold. A few people, in the severest instances, develop asthma as a result of continuously inhaling mold spores. In the same vein, mold can spur the onset of allergies. If the individual suffered from allergies prior to breathing in mold, the spores can exacerbate the allergy symptoms. People may experience allergy symptoms that are due to mold only a few months of the year or, alternately, year-round. Living with allergy-causing mold spores only intensifies the severity of the reaction. Common responses to spring mold include nasal drip, tightness of the chest, sneezing, coughing, inflamed sinuses, fatigue, nausea, headaches and breathing difficulties. How overpowering these symptoms present themselves to be depends on the individual’s sensitivity to mold. For instance, babies, smokers and the elderly are more likely to have a stronger, adverse reaction to mold spores. The health of people with weakened immune systems, like those with respiratory conditions, is easily overtaken by inhaling mold spores. 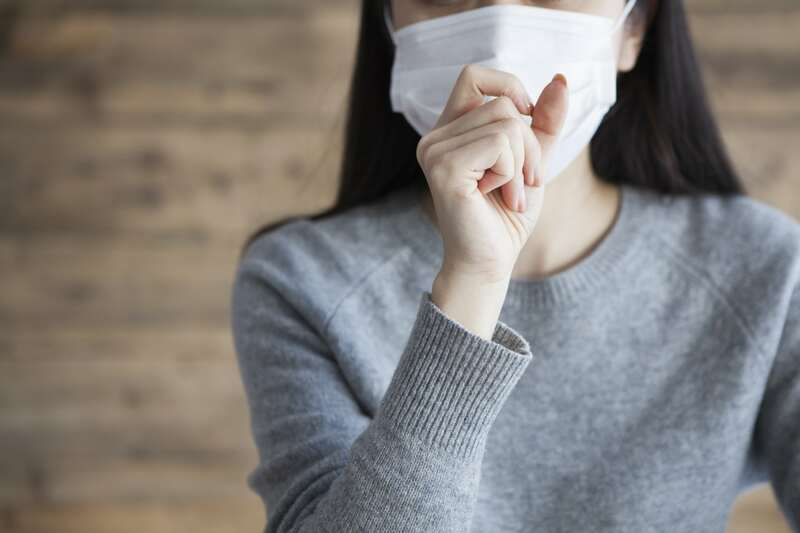 Treatments for allergic responses to mold that a physician may recommend include medications, like antihistamines, decongestant nasal sprays and nasal corticosteroids. Doctors may also prescribe immunotherapy. Non-medicinal yet effective methods to lessen the symptoms of allergies include limiting exposure to the mold and increasing ventilation in the living or workspace. How frequently an individual breathes in spring mold spores can debilitate a person’s lungs. Prolonged exposure to mold has the undesirable capacity to diminish lung function. Respiratory infections can result. Examples of such respiratory illnesses include bronchitis and pneumonia. Bronchitis is an illness that occurs when air passages leading toward the lungs become inflamed. Toxic black mold (Stachybotrys) is known to provoke breathing difficulties and bronchitis. Black mold infests the water-saturated areas of buildings, like walls, ceilings and rooftops. The Center for Disease Control associate the prevalence of black mold with the onset of lung disorders, like chronic bronchitis. Pneumonia can develop as a result of exposure to spring mold spores. The mold weakens the person’s immune system, making them more susceptible to developing complications, like pneumonia. People who develop bronchitis due to mold can, to an extent, provide self-treatment. Along with drinking plenty of fluids and getting adequate rest, a sufferer benefits from having a warm-mist humidifier in the room. The added yet controlled level of moisture in the air helps clear out mucus. The most critical step is to clean out the humidifier frequently to prevent outbreaks of mold. Flurries of invisible mold spores fly throughout the environment. There is no way to thwart the existence of mold. As a natural organism, mold is found everywhere, oftentimes serving as a beneficial resource by helping eat away decayed matter in the outdoors. Homeowners should, however, limit the presence of indoor mold by keeping the interior of the home dry. Basement leaks, condensation around window frames and roof leaks should be fixed immediately to prevent excess moisture from seeping into the home. Without a constant water source to nourish them, mold spores have little chance of surviving. Not only is mold noxious to one’s health, but mold spores can destroy physical structures, like materials found in the home. Before significant damage occurs to your health or your home, contact a reliable mold remediation service to stop the spread of mold. Professional mold technicians conduct an initial assessment regarding the extent of mold growth in your home. Hidden mold growth, such as infestations behind drywall and beneath wallpaper, is identified using advanced technology. By keeping the affected rooms isolated, the mold remediation technicians ensure the spores do not contaminate other parts of the home. The specialists then use powerful cleaning solutions to dislodge all mold from the premises. Calling in a professional mold remediation company for immediate mold removal is advised as soon as you discover the mold problem. Attempting to clean the mold growth yourself may only cause the spores to spread to other rooms inside the home. Whether the mold growth is less than ten square feet or an all-encompassing one that invades a large expanse of your home, mold remediation professionals are prepared to eradicate the mold colonies for good.